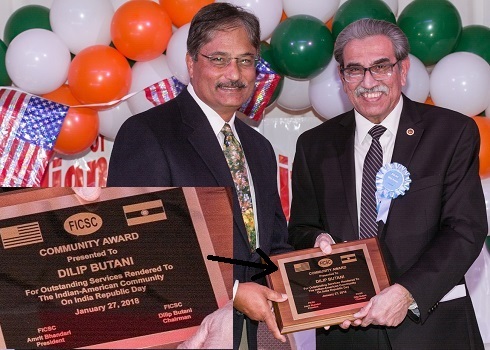 Federation of Indian-American Community of Southern California celebrated, India’s 69th Republic Day in a grand way, at The Himalayan Cuisine, Artesia. The beautifully decorated restaurant was overcrowded with Indian Americans. The guests included Assemblywoman Cristina Garcia, Mayor Sally Flowers, Former Mayor Dr Prakash Narain, Councilman Ali S Taj. Councilman Naresh Solanki was represented by Deepak Jhaveri. As per the tradition, the formal function started with lamp lighting by the guests and the executive committee members. This was followed by the National Anthems of USA and India. Chairman Dilip Butani welcomed the guests and in his brief speech said that it was on this day that the constitution of India came into force and India became a truly sovereign state. President Amrit Bhandari then introduced the team and mentioned that each and every one had worked very hard for this function. All the guests highly spoke about Indo-American relations and presented the Committee Members with certificates of recognition. Co-Chair Mohan Sharma was the master of ceremonies. Secretary Prakash Pancholi proposed vote of thanks. The reception was followed by a cultural program put together by Kalaimamani Dr. Sinduri, Smita Das and Charu Shivakumar. In the end was a group dance by Mumbai Madness Group. There were presentations by Dr Asmath Noor and Aparna Hande. The function was followed by a sumptuous dinner and live music. It was one of the best functions in recent times and an event to remember.